Shoreline Impact Analysis helps to answer: If oil is spilled at a given spot, what shoreline locations are likely to be affected? Response Time Analysis helps you estimate how quickly a response must be mounted at a location of concern to precede the arrival of the oil. Site Oiling Analysis helps you visualize how a location of concern would likely be oiled by a spill at a given location. Threat Zone Analysis helps to answer: Where might a spill occur that could threaten a particular location of concern? Resource Analysis helps you estimate the level of response needed to adequately address impacts of modeled spills and the quantity of a particular resource that could be impacted by given spills. The bathymetry (water depth) and shoreline configuration of a particular body of water, including its channels, bays, and significant rivers. Shoreline characteristics that determine beaching and refloating of oil. Then for each season, the model generates 500 individual oil spill trajectories from each of about 200 potential spill locations. The model then compiles statistics for where, when, and how much oil impacts receptor sites into data files for TAP. TAP displays a map of a specific local area, including a major water body and the adjacent land. 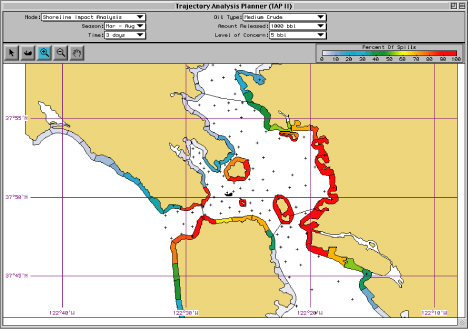 The map displays shoreline segments that represent the locations of shoreline resources, such as seabird colonies or marine mammal hauling grounds; sites of particular socioeconomic value, such as tourist beaches or large marinas; or areas where remediation measures would be difficult or expensive. You can use TAP to evaluate the probable threat to any of these sites from an oil spill that originates at any point within the mapped water body. Versions of TAP have been developed for the following locations. The TAP files have been compressed as self-extracting zip files so that they can be downloaded more easily from the Internet. [Need help with compressed files?] Also note that some of these zipped files are very large, so download times may be long. Inchon Harbor, Korea [Zip, 342.1 MB]: This TAP version was created by Dr. Khang of the Korean Ocean Research and Development Institute (KORDI). No documentation is available for this version; however, the documentation for other TAP versions can be generalized for this version. Arctic [Zip, 745 MB]: This TAP was developed by NOAA OR&R and the NOAA Restoration Center, with funding from National Fish and Wildlife Foundation. It covers the region of the Beaufort and Chukchi Seas, from the western Canadian border to the eastern Russian shoreline and south to the Bering Strait. The Arctic TAP Fact Sheet [PDF, 666 KB] provides a brief description of it. TAP Fact Sheet [PDF, 630.4 KB]: This short fact sheet describes the Trajectory Analysis Planner (TAP) in more detail. The NOAA Trajectory Analysis Planner: TAP II [PDF, 142.8 KB]: This short paper describes the history of TAP and TAP II, and the methodology and display modes of TAP II. GNOME: Oil spill planners and responders use the oil trajectory model, GNOME, to predict how wind, currents, and other processes might move and spread pollutants that have spilled on or in the water. GNOME is used to compute the oil spill trajectories used by TAP. Environmental Sensitivity Index (ESI) Maps: To decide which areas in a given region are most important to protect and eventually to clean up, responders use our Environmental Sensitivity Index (ESI) maps of the region. You can obtain paper or electronic ESI maps for many regions of the U.S.
ADIOS: Emergency responders use the oil weathering model, ADIOS, to predict how an oil slick can weather (change its properties) over time. Trajectory Analysis Handbook: A publication for spill responders and planners describing the basics of analyzing the forecasted trajectory of spilled oil, including an overview of the physical processes that affect oil movement and behavior in the marine environment. Available in English and Spanish. Questions: Contact us with questions, comments, or suggestions about TAP.